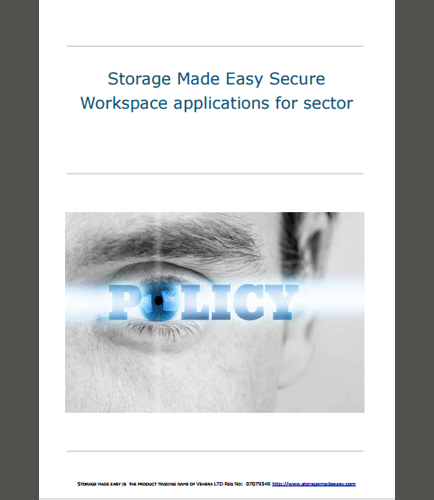 "Secure Work Space Applications for Sector Networks"
Secure Workspace applications for sector. Storage made easy secure work space application is a cloud file manager for SECTOR network. What is SECTOR Network? What is the role of SECTOR network in an IT enterprise? Sector network is an application ecosystem of business applications that are wrapped with added security features and IT management capabilities for Enterprise IT. The Storage Made Easy Sector Applications enable organizations to take advantage of the extended secure ecosystem that Sector provides to provide the Bring Your Own Device and mobile device management features that companies are looking to embrace. This paper talks about storage made easy secure work space that provides a private on-premise file sharing facility and sync solution that is storage sceptic, which can be used as an Enterprise File Share and Sync Application for private and public cloud data. What is Bring Your Own Device concept? How it enables corporate data security individually? What are the solutions provided by EFSS to overcome Sprawl data and Shadow IT?